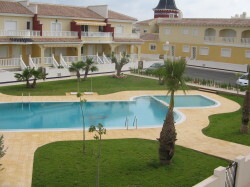 VILLAS AND APARTMENTS TO RENT IN ROJALES, SPAIN. Welcome to our selection of holiday homes to rent in Rojales, Spain. The inland town of Rojales is located a few kilometres from the Costa Blanca, close to the resort of Torrevieja and the larger towns of Murcia, Cartagena and Alicante. Most famous for its historical buildings, natural attractions and nearby network of caves, the area around Rojales is ideal for those who like to spend their holiday exploring new environments on foot rather than lying on a beach. Much of the old town of Rojales dates from the 13th century and the end of the Moorish occupation. Parts of the old defensive fortress remain, but perhaps the most impressive monument is the 18th century bridge that crosses the River Segura. A 16th century dam, called the Azud and used to raise the level of the Segura for irrigation purposes, is still in use today, and will often be demonstrated for visitors. On Calle Vilatona, tourists can see one of the more unusual attractions in the area, a private home that has been decorated with thousands of shells, mirrors and pieces of tile found on nearby beaches. Although Rojales is far from being one of the main tourist destinations in this part, there are still a number of rental apartments visitors can stay in, if they decide to make this town their base for exploring the Costa Blanca. There is a good selection of restaurants too, many serving speciality Spanish and local dishes. If you are self catering, the weekly market in Rojale's main square, every Thursday, can help keep you stocked up. One of the most popular day trips from Rojales is to the Rodeo caves. Unlike natural caves, these were carved and extended by hand to become 19th century homes for the rural poor. Visitors can experience what life would have been like in these underground homes, as well as visiting one of the two wells that used to keep the town and its farmer supplied with vital water supplies. Another popular destination is Torrevieja's natural park, La Mata. An intriguing landscape of salt marshes, this area is home to some unusual species of birds, plants and animals. There are several paths and bike trails criss-crossing the region, and maps of the area can be picked up from local tourist offices to help make sure you don't miss any of the sights. If you have a car or are willing to take public transport, you can easily get to the resort of Torrevieja itself to spend a day on the beach or exploring this pleasant, traditional Spanish town. Kids will be happy to hear that Torrevieja also has its own water park! Looking for self catering holiday accommodation in Rojales? Then below is a selection of apartments in Rojales and villas in Rojales that can be rented direct from their owners. You can either click on each listing for further details or you can use our search engine on the left if you are looking for something in particular.